Our Christmas box arrived! So we cranked up the Christmas tunes, made lattes, and sat around opening gifts and praising GOD for incredible family. Thanks for sending it all the way here, and thanks for taking the time to pack and wrap everything so nicely! Who’d have thought someone could get so giddy over a pneumatic milk frother? I got a little teary-eyed when I saw Mom’s lovely handwriting. Following suit with Western tradition, you were probably enjoying a little time off on Christmas day; friends, family, food or some lovely combination of the three. I’m green (and red!) with envy, because I was at work. I’ll admit, my attitude was pretty sour beforehand, but I think my students learned and had a lot of fun, and that’s my job, right? Right. So here are the “days” from the song we sang, “The 12 Days of Christmas in Bangkok”, and below is a shortened clip from the show. You’re more likely to appreciate this – if at all – if you’ve spent some time in Bangkok – just a forewarning. On the 12th day of Christmas Bangkok gave to me! 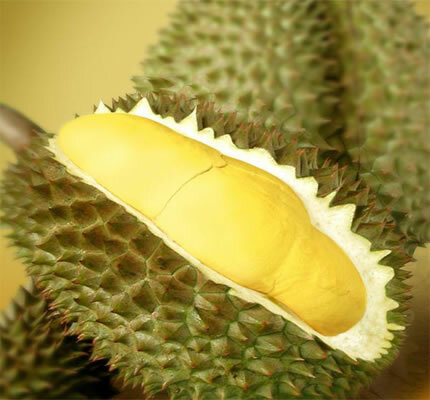 and a durian so big and smelly! My family always took a pretty private approach to Christmas, but this year’s been just about as public as it gets. Parties, work, meeting new people, and lots of eating. Cayla decided to throw a couple of Christmas parties for all the melancholy expats who didn’t have anywhere to go for Christmas – it was a really great time! I’ve posted some pictures of our shenanigans here. In other news, I saw Avatar in 3D at the IMAX yesterday and it melted my face. Other than The Lord of the Rings, I’d say this was my favorite theater experience ever. So epic. Go see it. The kindergartners skip anytime they go anywhere. I really don’t ever see them walk or run. They just skip and smile. They’re all dressed in red pinnochio costumes and the girls all have pigtails; if you were dressed this way, you’d skip too. It’s is the sweetest thing ever. I’d teach kindergarten for free. Oh and in a few days we’ll be flying north (Chaing Mai) for the winter, so I’ll probably be out of contact until after the first weekend of January. 5 days for just the two of us to relax and enjoy cool weather. We may even go rock climbing! Take care, and I’ll see you all next year!